Be honest…when you first saw this article you clicked on the above image to play a video, right? Although it is a simple image with a ‘play’ icon, our brains have evolved so that they instantly recognize that a sideways triangle is a symbol to play a video. This is a perfect example of how videos have become a powerful tool for generating interest and enticing viewers to act by clicking. Here is another question. If videos create that instinctive urge to click, couldn’t this tactic prove useful in a business’s social media marketing strategies? The answer is a hard YES. Properly utilizing social media videos for your business accounts can put you at a distinct advantage over companies that do not. Let’s delve into why social media videos are so effective for online marketing. By constructing a video that highlights your company’s goals, environment, and overall persona, you become more relatable by illustrating your true colors to potential customers. Videos that show the human side of your business are more likely to be shared and talked about if they side with the audience’s values or ideas. This spreads awareness of your brand, building trust in your services and resulting in more prospective leads. Similarly, a video can help inspire potential employees. You can show what it is like to work for your company and really promote the culture, influencing people to submit their resumes to you. 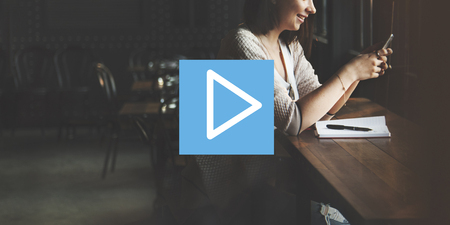 Similar to the play button technique, include a clear and eye-catching call-to-action (CTA) in your video that prompts someone to click on a link. This link, inserted into the video’s description, could lead the reader to your website to learn more about your business, forward them to your other social pages, or entice them to purchase items or services from you. So how can videos be set up to enhance your marketing strategy? Each outlet has a different maximum video length. Snapchat is 10 seconds, Instagram is 60 seconds, Vine is 6 seconds, Twitter recommends under 30 seconds and Facebook is 120 minutes. This is a huge range of time to play with depending on what medium you’re designing your video for. You can use Facebook for longer videos that go more in-depth into your company, while the others require you to use the most of your time and gain people’s attention quickly. Facebook Live and Periscope allow you to broadcast in real-time. This can be a terrific way to generate interest. If you are going to do this, make sure you prepare your material to seem as natural as possible; especially if the idea of public speaking makes you nervous. You need to make sure you have a strong opening so people don’t close your video. If they aren’t interested quickly, they will move on. People like watching videos for two main purposes; to be entertained or to be educated. If a viewer already has an interest in your company, how-to videos or informative tutorials about your services or products can provide extra value to viewers. When writing descriptions and headlines for your videos, make sure to keep Search Engine Optimization (SEO) in mind. Use relative keywords to help potential viewers find your social media videos easier. Posting content on a personal social media page is one thing, but sharing professional and informative content about your business is a completely different story. Although many people may love to see silly cat videos, these types of posts won’t help drive more interest to what you are selling. By keeping the above tips in mind, your social media videos can aid in making your online presence bloom, and ultimately increase the overall success of your business. While we’re on the subject of social media, be sure to check out Social Connect on Facebook for additional information to help your business’s digital presence thrive!